To help keep your teeth healthy, it is advised that you eat only three or four times a day, avoiding the temptation to snack in between – and if you must snack, then choose something that has no or minimal amounts of sugar in it, such as cheese, nuts, raw vegetables or breadsticks. This is because every time you eat or drink something with sugar, the bacteria in your mouth reacts with the sugar which produces acid that attacks your teeth. If these attacks happen too often, your teeth will suffer decay. In addition, you should avoid acidic or fizzy drinks, as these can cause tooth erosion, where the hard outer coating (enamel) of your teeth is gradually worn away by repeated acid attacks. 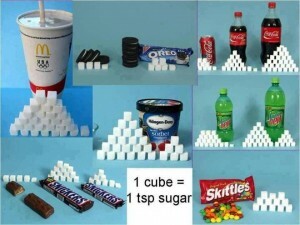 If you must eat or drink sweet stuff, either ensure it is sugar free ( low sugar or no added sugar still contains sugar! ), or indulge less often – at or immediately after mealtimes is ideal. You can also chew sugar-free gum with xylitol after eating or drinking to help boost saliva production and neutralise decay. 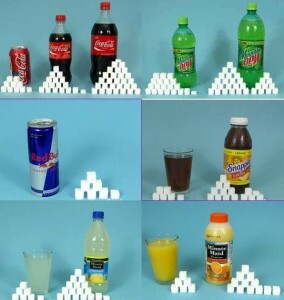 Below you can see a couple of pictures of common snacks and drinks with their equivalent sugar content. This entry was posted in Dentistry, Dentistry in the News, Oral Hygiene, Share This Post on 26 July 2012 by Dr Nishan Dixit.